The health of our forests directly impacts the health of the planet. The importance of forests to the Earth’s ecosystems cannot be overstated. Research shows that forest die-offs are on the increase and this troubling trend is being linked to global warming. Heat and water stress associated with climate change are making forests vulnerable to insect attacks, fires and other problems. The evidence for global warming continues to mount with March 2012 being the warmest in recorded history in the U.S. and January to March 2012 being the warmest first quarter on record in the lower 48 states. This is but the most recent data corroborating an increasingly irrefutable body of evidence. Greenhouse gases are fueling global warming and we continue to pour massive amounts of these emissions into the atmosphere. About 10 billion tons of carbon is being dumped into the atmosphere every year from the combustion of fossil fuels and the destruction of forests. The concentration of the gas in the atmosphere has jumped more than 40 percent since the Industrial Revolution, and this could double or even triple this century. Despite the wealth of data supporting global warming and the crucial importance of forests to planetary health, world industry leaders in wood materials are gathering in Seattle on April 11-13 to discuss the role of woody biomass for production of biofuels. According to a UBC study, wood-based biofuels could be a competitive industry by 2020. While biofuels offer questionable benefits to the planet, wood based biofuels are even more suspect. Trees are being cut down much faster than they are being planted. According to United Nations Educational, Scientific, and Cultural Organization’s (UNESCO) “World Culture Report: 1998,” during the period between 1990 – 1995, reforestation accounted for only 11% of the deforestation amount, meaning the world regenerated only a single tree for every ten burned down. Total deforestation at the 1990 to 1995 rates eliminated approximately 45-50 million tons of carbon dioxide (CO2) absorption per year. (This is based on the very general assumption that 2.9 tons of CO2 are absorbed per average hectare of “forest”). Reforestation at the 1990 to 1995 rates added back the capability to absorb just 5.5 million tons per year. From 1990 to 1995, close to one million square kilometers of forest were destroyed. The destruction of forests continues unabated. Each day, at least 80,000 acres (32,300 ha) of forest disappear from Earth. At least another 80,000 acres (32,300 ha) of forest are degraded. Overall, FAO estimates that 10.4 million hectares of tropical forest were permanently destroyed each year in the period from 2000 to 2005, an increase from 1990-2000, when around 10.16 million hectares of forest were lost. Among primary forests, annual deforestation rose to 6.26 million hectares from 5.41 million hectares in the same period. Trees are under siege all around the world, including euphorbia trees of southern Africa, Atlas cedars of northern Algeria, Australia’s Eucalyptus trees, Siberian forests, and the Amazon rain forests. In Sumatra alone, tens of thousands of hectares of forest land have been drained and cleared and this is driving elephants, tigers and orangutans to local extinction. In addition to providing habitat for a wide range of animal species, forests play a pivotal role in absorbing CO2. The most recent science suggests that trees absorb more than a quarter of the carbon dioxide emitted by the burning of fossil fuels. “[W]e’re recognizing the potential great value of trees and forests in helping us deal with the excess carbon we’re generating, we’re starting to lose forests,” said Thomas W. Swetnam, an expert on forest history at the University of Arizona. Trees that have the ability to lock carbon into long-term storage, and they do so by making wood or transferring carbon into the soil. The wood may stand for centuries inside a living tree, and it is slow to decay even when the tree dies. However, if a forest burns down, much of the carbon stored in it will re-enter the atmosphere. According to a 2011 estimate published Aug. 19 in the journal Science, when emissions from the destruction of forests are subtracted from the carbon they absorb, they are, on balance, packing more than a billion tons of carbon into long-term storage every year. 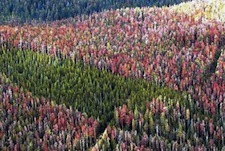 Even the forests that are being replaced are far less biodiverse and they have a diminished capacity to absorb carbon. This is a dangerous cycle; the fewer trees there are, the faster CO2 will rise and the more the remaining trees will be impacted by an ever warmer climate. The loss of forests increases the levels of atmospheric carbon. Burning of forests to make way for more agriculture in places like Brazil and Indonesia is particularly destructive because it ends their ability to absorb carbon and emits carbon back into the atmosphere. Wildfires, insect infestations and extreme weather are combining to decimate many forests. In the summer of 2011, wildfires destroyed huge swaths of U.S. forests stretching from the mountainous Southwest deep into Texas. Extreme weather–a corollary of climate change—is also imperiling forests around the world. Global warming is increasing the number, size and severity of forest fires, in North America, it is also contributing to the proliferation of forest destroying bugs like pine beetles which are surviving warmer winters in greater numbers. Warmer winters are also causing snow to melt earlier, which is reducing the availability of water in summer. This then combines with warmer summer temperatures, which increases the water needs of trees. There is a powerful rationale to manage our forests more responsibly. While unsustainable forest management practices are economically counterproductive, sustainable practices offer a wealth of socio-economic benefits. There is real value to healthy intact and sustainably managed forests. One researcher demonstrated how a forest can be worth more than a goldmine. As reviewed in a Mongabay.com article, ecologically unsustainable practices are proving to be economically ruinous in places like Indonesia. The Rajawali Institute for Asia at the Harvard Kennedy School of government estimates that by eliminating its natural capital for negligible gains, deforestation caused losses of $150 billion to Indonesia between 1990 and 2007. An investigation by a task force set up by Indonesian President Susilo Bambang Yudhoyono found that unsustainable forestry practices have cost 76,000 jobs in the sector in the Jambai province alone. According to the Rand Corporation, particularly intense forest fires in Indonesia and Malaysia have increased deaths by 22 percent. Bad air quality can also send people to the hospital and increase asthma attacks, lowering productivity. One of Southeast Asia’s challenges is attracting global companies to locate high-level executive headquarters in the region, in part because of the intense air pollution exacerbated by forest fires. It has been demonstrated that forests can even protect against tsunamis. Studies have shown that coastal mangrove forests can reduce tsunami flow by as much as 90 percent. (During the 2004 tsunami, villages that had cut down their mangroves were often wiped out while those that maintained them fared much better). Trees are suffering from the ravages of climate change and this has catastrophic implications for life on the planet. The losses of forests have far reaching impacts that include agriculture, economic competitiveness and ultimately, human well-being. Even more significantly, the loss of trees irreparably undermines the Earth’s ability to heal itself. Forests are fundamentally important to the health and survival of the planet and therefore a crucial component of efforts to combat climate change. To preserve our forests, we need to reduce emissions generated by burning fossil-fuels and deforestation, we also need to understand the overarching value of trees. Primary forest protection is the primary matter. It’s a very good article, despite some minor quibbles. The print function on your website is atrociously bad, however, both in FF and IE. It’s one I wanted to save in hardcopy, so no snarky replies about burning up trees for unnecessary prints, thank you very much. Thanks for the comment. No snarky replies, I promise. In fact, I’ve just installed a new plugin to improve printing and pdf functions based on your feedback. I’m still tweaking it, but this should improve your experience in saving posts for hardcopy. 3.Deforestation – What is the real impact? Thank you for caring about our crucial forests that help to sustain all life on this planet.